This is my review of the Moto G. Motorola is back! It took time, but with the International launch of the Moto G we can say that Motorola has its mojo back. Call me nostalgic maybe, but there are two companies that always have a special place in my heart: Blackberry and Motorola. I’ve had great experience with Blackberry smartphones (within the obvious limitation of their OS 6 and 7.1) and I had great moments with Motorola. In fact I owned two Motorola devices before the Moto G. The first one was the ultra sleek Moto Razr V3. I’m pretty sure you remember the ringtone: Hello Moto! OMG that was a great phone. Then for my second Motorola device I had the pleasure to own the XOOM tablet! Don’t laugh… but the XOOM was a hell of tablet, powered by an extremely bad OS: Android Honeycomb. The XOOM was very well built, powerful, had 2 cameras and a sleek design. I really loved my XOOM but the user experience with Honeycomb was very poor.So, a few years later...I’m back to you Motorola and this time with a new smartphone: The Moto G. I decided to write my personal review about the Moto G, and maybe it will help you if you are searching for a new phone. WHAT DO I LIKE THE MOST ABOUT THE MOTO G? The price: I am tired of buying expensive phones. So the price of the Motorola Moto G (a little bit more than £100 for the 8GB sim free) is a great PLUS, especially with the amazing specs. If like me, you are tired of all those flagship devices that cost more than £500-£600, the MOTO G is a really good and impressive phone. The design: It is beautiful. It doesn’t feel like a cheap plasticy phone. In fact it is very sturdy and it fits perfectly in my hand. Moto G has a gorgeous 720HD display. It has great viewing angles and the colors are brights and accurate. You won’t be disappointed with the quality of this amazing 4.5 HD screen. Speed and Processor: The Qualcomm Quad Core processor in this phone is speedy, it handles everything, and thanks to an almost pure Android Kit Kat experience, there is nearly no lags (Samsung...are you reading this?). For me a laggy Android experience has been the reason why it took me time to come back to the mobile Google OS. My wife has a SIII mini and this is the worst ever. I had the Note II and after few months the device was so laggy that I had to sell it or smash it :)...I sold it! So yes, performance is amazing, and this is probably the first time I am enjoying a stress free Android experience. You can easily watch HD movies without any trouble. And as it was a Google company, it will get regular OS updates. This Motorola smartphone is a speedy one. 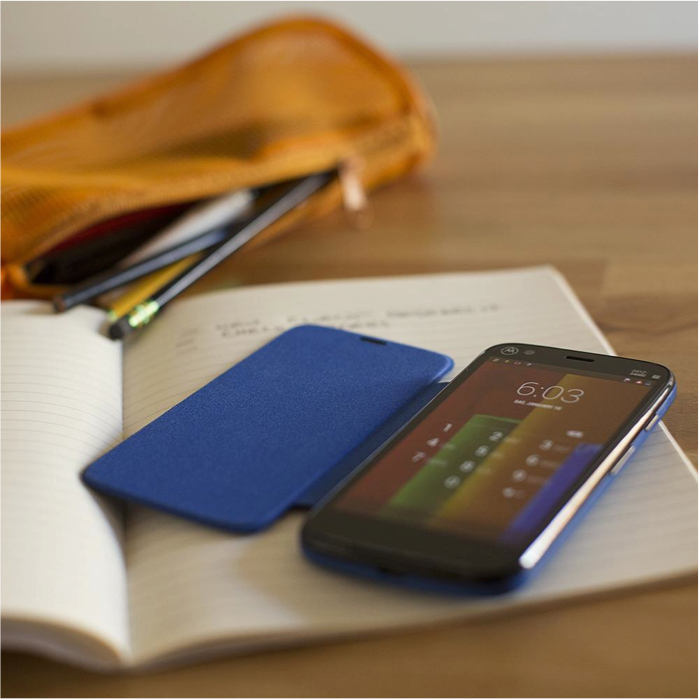 You will be impressed with the Moto G! Call and wifi quality. I have to say I’ve never had a dropped call, and I can hear people perfectly on the other line, and I think that the people on the other side can hear me clearly too. So, no problem here either. What about the Wifi? I have 60mb Virgin Media cable at home. I just did a speedtest right now and got a 34 Mbps on the Moto G. Which is extremely good, especially at this time when speed on Virgin can be a bit lower. To compare, I just made a speed test with my Chromebook and got a 43Mbps. So I think the Wifi on that phone is very good. We don't use so much a Smartphone to make phone call, but when you need you can be sure that the Moto G won't fail. Battery life. Once upon a time my first Smartphone was an HTC Desire and the battery lasted around 4 hours! With the big 2070 mAh battery, the Moto G will be your faithful companion all day long. This battery is great and does what is written on the box: last all day. By the way, the phone comes with a micro USB cable but no charger! With so many good points, I am sure you are thinking this phone deserves 6 stars out of 5! Almost - because here come the ‘cons’, and basically there is only one, but this is a big one! The Motorola Moto G has a 5MP camera and it's just OK (with lovely weather conditions) but it has some problems to focus, images can be quite grainy. So the camera is a huge disappointment. It has HDR, and the camera app has improved since the latest Android update, but still, it is not there (especially in low light conditions). Some people will say for the price that the Moto G costs...don’t expect an outstanding camera. I know, but the Moto G was supposed to be the big relaunch for Motorola. I think this is a missed opportunity. Motorola please we need better cameras! So that was my personal thoughts about this amazing little device. Will I keep it? Now the Moto X is available in the UK….I am not too sure. But whatever happens, I am having great times with this smartphone. And having a pure Kit Kat experience is so much better than any Touchwiz, Sense, etc…. Dear Samsung, HTC, Sony, LG etc…. Motorola with the Moto G is proving to the world that a great smartphone doesn’t have to be expensive. Instead of focusing on flagship devices at £600 (Sim Free), an amazing phone at £150-£250 (Sim Free) would be very refreshing and could take the world by storm. So that was my review of the Moto G by Motorola. Do you agree with the review? Do you own a Moto G? What are your thoughts about the device? Love it? Hate it? Are you more a Flagship user? Please feel free to comment and feel free to share this review. Buy the Motorola Moto G?